Volcano is a clever, puzzle-style game in which players move "caps" around on top of a group of volcanoes, triggering eruptions which cause colored streams of lava to flow out across the playing field. The object of the game is to capture as many pieces as possible, with bonus points awarded for special combinations. Each player attempts to accumulate the highest score and then bring the game to a close before another player has a chance to steal the lead away. 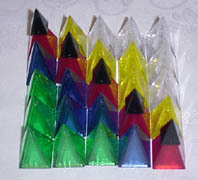 Multi-player Volcano supports any number of players, though between 2 and 6 is best. It can be also played by a single player as a solitaire challenge. 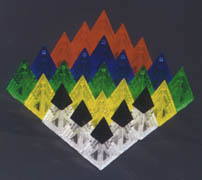 Each stack of pieces within the 5x5 grid represents a volcano, and the five small black pieces represent "caps" which keep the volcanoes beneath them from erupting. On your turn, you may move any one of the five caps in any direction (horizontally, vertically, or diagonally) for a distance of one space. You may not place a cap on top of another cap, and you may not move a cap outside of the 5x5 square. Any other move is legal. Moving a cap may cause the underlying volcano (if there is one) to erupt. If a move does not cause a volcano to erupt, you are allowed to make another move with one of the caps. You may continue to move caps in this fashion until an eruption does occur, at which point your turn ends and play passes to the player on your left. The erupting volcano is completely spent, leaving an empty space in its place. Remember that this empty space is still part of the playing area. Black caps may be moved into it, and erupting pieces may land in it as normal. The eruption runs up to the edge of the 5x5 playing field. Since pieces cannot be placed outside the bounds of the original 5x5 square, an eruption must stop when it reaches this limit. The eruption runs up against another black cap. Since you cannot put any other pieces on top of black caps, they block the flow of eruptions in much the same way that the edges of the playing field do. After you've finished executing the eruption, you may capture any erupting piece which has landed directly on top of a piece of the same size. Keep all of your captured pieces in front of you, to be tallied at the end of the game for your final score. It is possible to move a black cap without causing an eruption. For instance, if you move a cap from the middle ring of the board to the outer edge, the uncovered volcano will not erupt, because its pieces are not allowed to flow off the edge of the board. Similarly, other black caps may block eruptions before they even start. Finally, a cap sitting in an empty space may be moved without causing an eruption, because there is nothing beneath it which can erupt. During your turn, you may continue to move black caps until you cause a volcano to erupt. With practice, you can learn how to position the caps just so, in order to capture the exact piece you're hoping for. You're free to rearrange your captured pieces at any time during or after the game, in order to create the best possible score. The game ends as soon as any single player has captured one or more pieces of each color. After the game ends, make sure you've arranged your captured pieces into as many solid-color and mixed-color trees as possible. Then tally up your final score. The player with the highest score wins. Stage 1: A black cap is moved off of a clear volcano, causing it to erupt. Stage 2: The top piece from the erupting volcano sails over the black cap to land on the green volcano beyond. Stage 3: The next piece from the erupting volcano sails over two volcanoes to land on the blue one. Stage 4: The next and final erupting piece sails even further to land on the distant red volcano. Stage 5: One of the erupting pieces has landed on a piece of the same size. You get to capture it! Volcano also makes for great fun as a solitaire activity. (In fact, Kristin initially envisioned it as a solitaire game.) Solitaire Volcano is more like a puzzle than a typical solitaire game; the trick to these solitaire challenges lies in developing your ability to move the black caps around, so that you'll be able to take the specific piece(s) you desire. It may take a few games, but once you get a perfect score you'll probably want to tackle a new challenge (or find other players) rather than solve the same puzzle again. These challenges make excellent training for multi-player Volcano. Try to capture all of the red pieces with a minimum of other colors. You get one point for each piece you take that isn't red. Assuming you begin with a black cap on a red piece, you should be able to get a perfect score of 0. Try to capture all of the large pieces with a minimum of other sizes. Try to capture exactly one complete tree of each color.